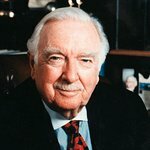 Television legend Walter Cronkite passed away after a long illness on Friday, July 17. The 92-year-old fronted the evening news for American TV network CBS from 1962 to 1981. He was well known for his charity work – he frequently donated lunches and trips on his private yacht to charities such as Realizing the Dream (a charity overseen by Martin Luther King III, eldest son of the Reverend Dr. Martin Luther King Jr., and co-founded by former United Nations Ambassador Andrew Young), recorded PSAs for the National Parks Conservation Association, and was honored by the Buoniconti Fund To Cure Paralysis, a nonprofit organization that serves as the national fundraising arm of the Miami Project to Cure Paralysis.